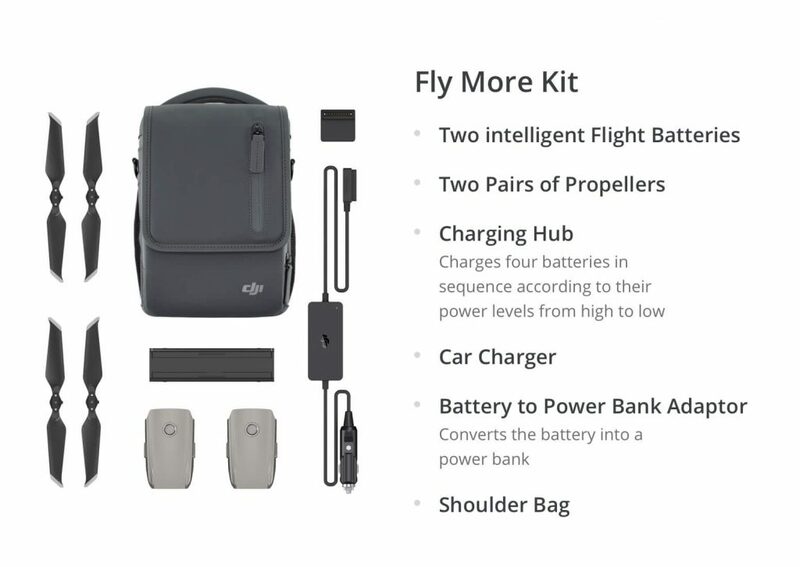 DJI has announced the highly anticipated Mavic 2 drones after postponing the original launch event back in July. There are two models to choose from, Mavic 2 Pro & the Mavic 2 Zoom with the main difference being the choice of the camera on the drone. The Mavic 2 Pro features a Hasselblad camera with a 20-mp 1″ CMOS sensor with support for 10-bit video & Hybrid Log Gamma and the Mavic 2 Zoom has a smaller 1/2.3″ CMOS sensor but features a 2x optical zoom lens. Both drones can record 4K UHD 30p with a maximum bitrate of 100mbps. Unfortunately neither can do 60p which the Phantom 4 Pro is able to do. How do they compare to the Mavic Air & original Mavic Pro? 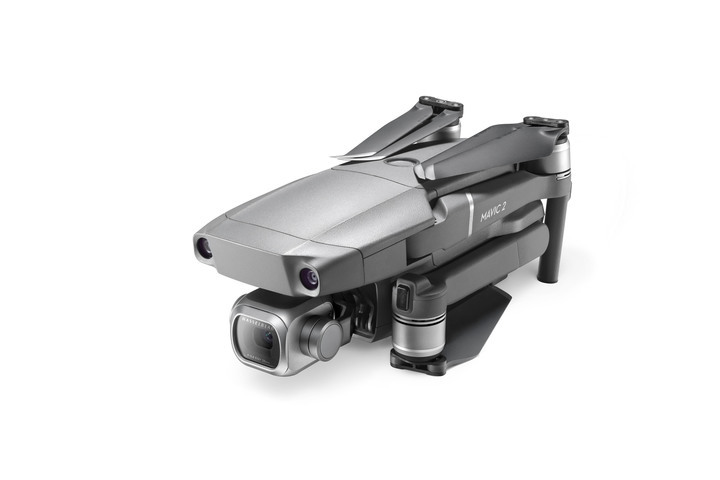 The Mavic 2 Pro & Mavic 2 Zoom both feature a very similar form factor and design as the original Mavic Pro with folding feet and detachable propellers. The Mavic 2 drones receive a higher maximum bitrate of 100mbps which is the same as the recent Mavic Air and up from 60mbps on the original Mavic Pro that many felt was too low for the resolution it was capturing. The Mavic 2 also receive the new OcuSync 2.0 for better video quality & longer range monitoring. Both drones are slightly heavier though at 905/907g compared to 734g of the original Mavic Pro. Depending on where you live, this change of weight may be a key factor as it may push the drone to a new class which may require a license to fly. 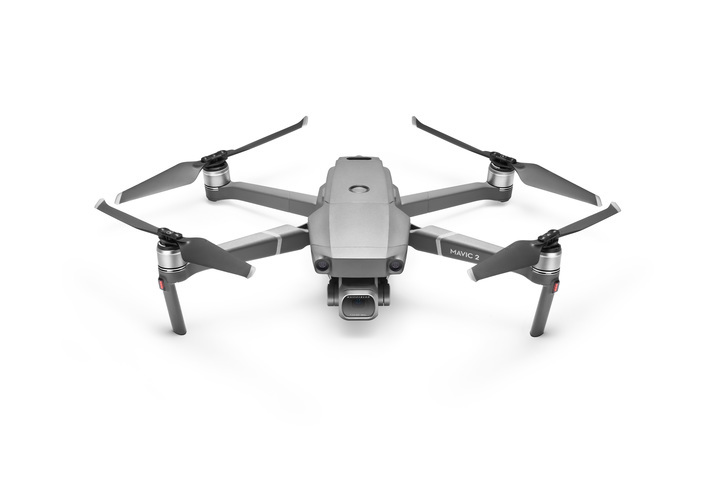 The new model also squeezes out 31 minutes of flight time compared to 27 minutes of the original Mavic Pro, and a minute longer than the updated Mavic Pro Platinum. We also see D-Log remain, just like in the original Mavic Pro but was a key feature missing from the Mavic Air. For those wanting the best video quality, they may lean towards the Mavic 2 Pro due to the larger 1″ sensor, 10-bit video capabilities & HLG recording. The 1″ sensor will definitely provide a nice improvement to low light sensitivity. When recording in Dlog-M, the footage captures in 10-bit, offering more colours and flexibility for the grade in post. 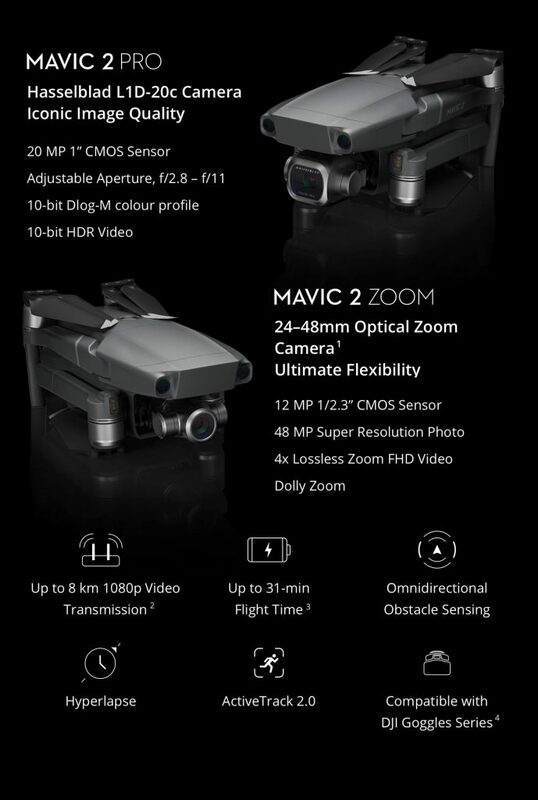 The Mavic 2 Zoom does have D-Cinelike and there the ability to film at the 48mm focal length will be appealing for some. The new drones now feature Ocusync 2.0 for high-quality image transmission to the operator, up to 8km at 1080P. Ocusync 2.0 works on both 2.4/5.8GHz where as Ocusync 1.0 which was on the original Mavic Pro used 2.4GHz only for a 720P image. These distances are also dependent on your location, with different CE/FCC regulations around the world. The Mavic Air has an even shorter distance of 4km using WiFi. Both drones feature omnidirectional obstacle detection with APAS and Active Track 2.0 to either avoid or fly around obstacles in the path of the drone. Active Track 2.0 now uses the camera and sensors to create a 3D image for its tracking capability for more accurate object tracking. It’s a fact. Drones go missing, crash, get stuck in trees or lost in the ocean. The DJI Care Refresh service plan covers damage to your DJI drone. Valid for 12 months, the plan covers user error, signal interference, collision & water damage. You will need to send in your damaged drone and can then choose to either repair it or use one of the two replacements at the replacement fee. See the full terms of service point VII. for a list of replacement fees. A new Gimbal & Camera program will also be available. DJI is taking pre-orders via their online store with the drone shipping now. Will you be ordering the new Mavic 2 Pro or Mavic 2 Zoom? Let us know your thoughts in the comments below.